We know that investing in a start-up company is highly risky especially if you don’t deeply understand the business model. 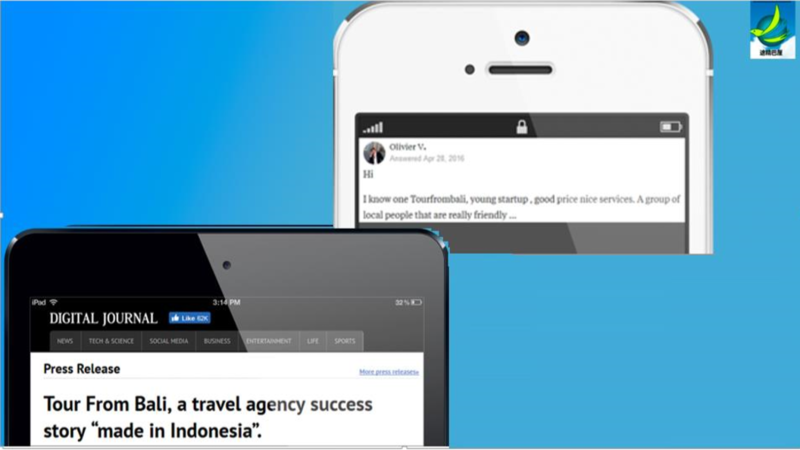 Thus, we’re compiling the questions that’s been asked by potential investors, business partners, and users (travel Agency) ensuring all stakeholders would understand behind the great idea and be more convinced. Can you tell me more about your business and team ? 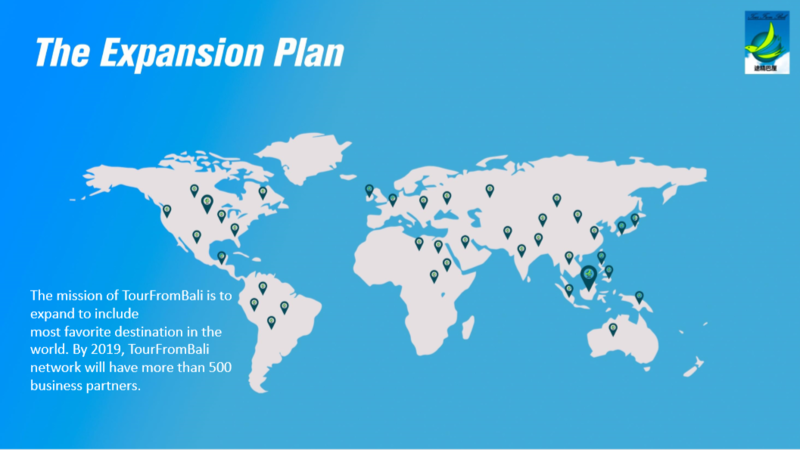 How do you operate currently in bali ? We’ve launched this business since 2016, the number of business partners contacted us has exponentially growing over time. We are bonding to create our-self a strong Team especially IT developers. Since my IT co-founder went to the same campus, we’ve met through our alumni gathering. Our business model is that we are seeking more customers for other travel agencies or sometime we make a direct booking to the hotel. We are serving in any kinds of travel products, ranges from MICE organizing, tour packages, hotel and flight ticket reservation. 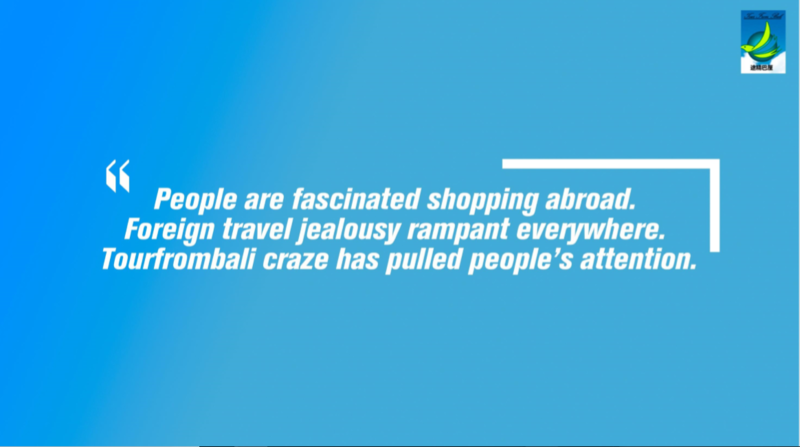 Until now, our customers are dominated by Chinese travellers. 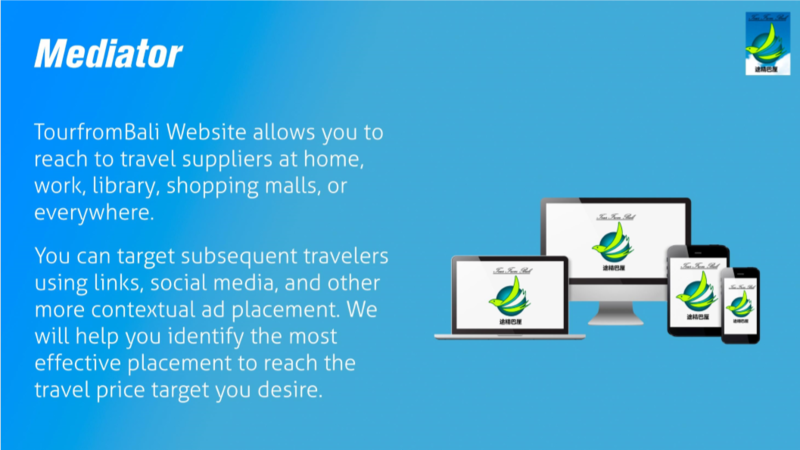 We obtained both, can’t statistically accurately tell which one is more, it seems 60-70% are foreign travel agency or corporates and the rest are B2C, but definitely B2C customers will make a purchase from us if the more web-friendly our website is. Nevertheless, they all founded us from online. 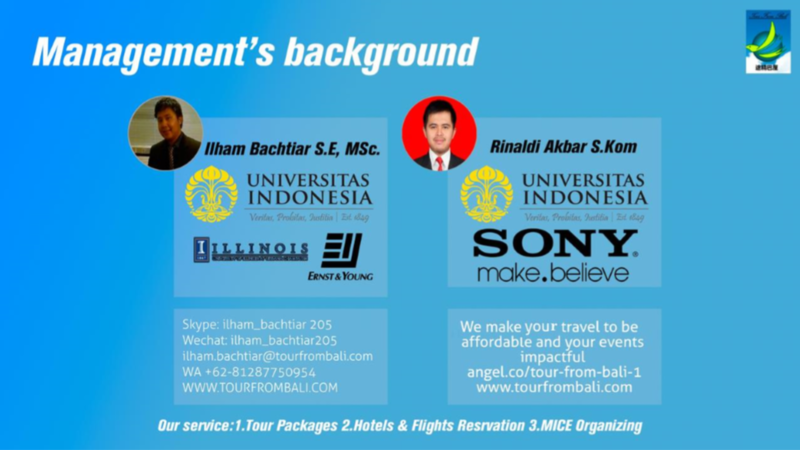 Also MICE organizers, whom have customers from abroad, tend to ask us to organize their event throughout Indonesia not just bali. As the MICE market is probably the biggest. Why do B2B tends to choose you ? Because we used a technology or web platform that probably most other competitors are not using, such as receiving money from Alipay or the simple web reservation. There are major big competitors targeting same Chinese customers such as TMS, HIS, etc, but they don’t have such Chinese platform so they’re getting more B2B. Are you profitable already ? 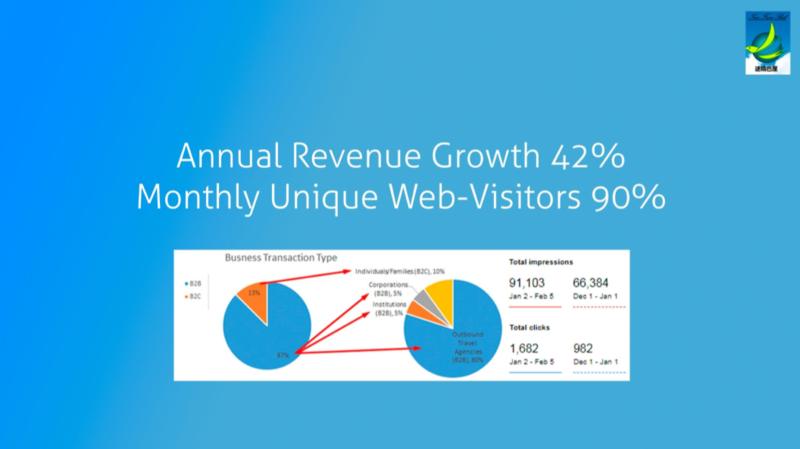 How much is your revenue ? We’ve only been operated for 2 years until then our churn rate continuously decreasing and the revenue increases over time. Our financial metrics or revenue is somewhere around $200k-$500K since we’ve started but it seems the revenue is driven mostly from MICE. Moreoever, more and more big players singing collaboration with us, thus we should be profitable soon. 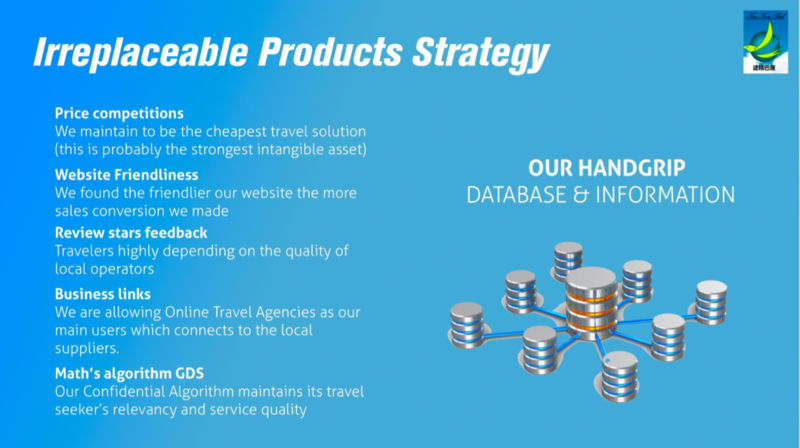 Not least, we’ve engaged and benefited many users (travel agency) since the launch of our company. 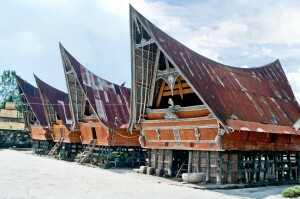 Where did this Tour From Bali Market Size number come from? We should be able to tackle 15% of the $823.4B serviceable availablemarket. Why do customers choose you over other agencies ? Mostly because of the price as the main point. But we contribute several other things, such as professional Chinese customer service, responsive, friendly website just basic standard competition. 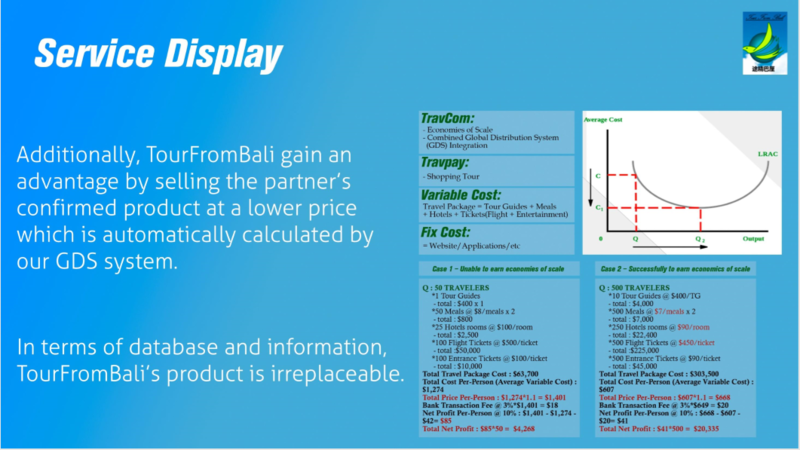 But honestly, some customers are disappointed with the price because there are several suppliers managed to sell lower because these agencies already developed TRAVCOM. Is it that you found the market tends to be inefficient and you’re the company that wants to fix this problem and how? Is the solution happening now ? We found the inefficient competition in the market mostly regarding the price. We found that some supplier are able to sell their price at a much lower price than any other suppliers. Thus, we want to help the company’s that are facing this problem to have a more fair competition. So I personally name this solution as a TRAVCOM. 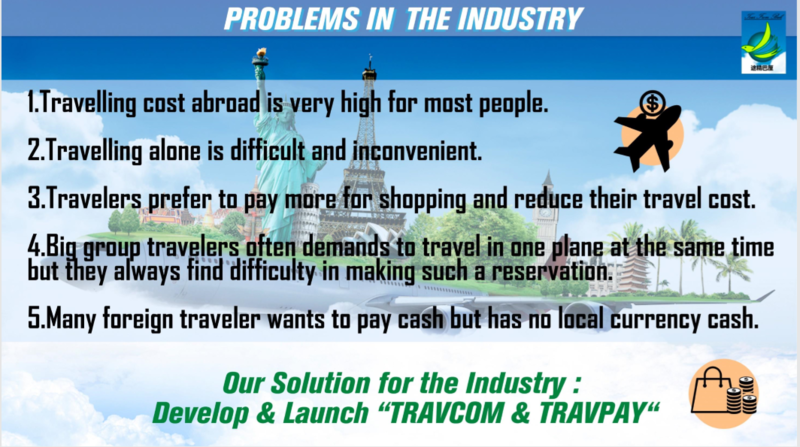 TRAVCOM system is already been happening in the industry but most business players were just using the standard conventional system. They compiled the list of the incoming travellers in an excel file to form the group. Meanwhile, we want to make it into an IT automation system. 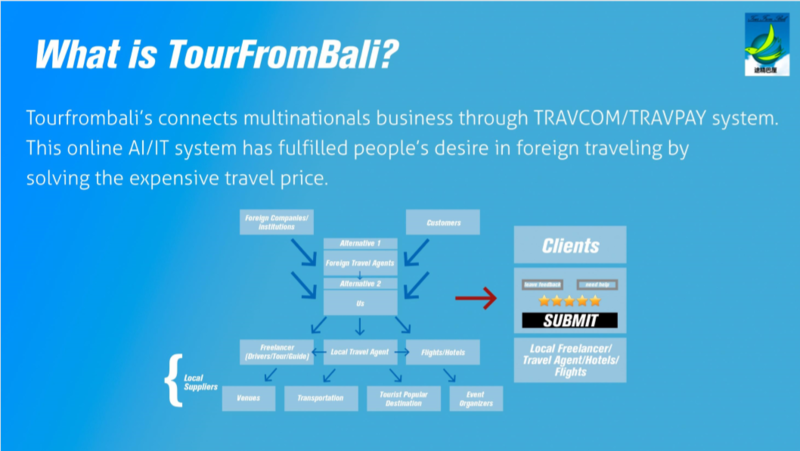 The conventional way of doing TRAVCOM is that, the travel agency sets a target amount of people, for example 200 people planning to go to Bali. Then they sought and bid for the right vendors with the right price they’ve set in their traditional system. 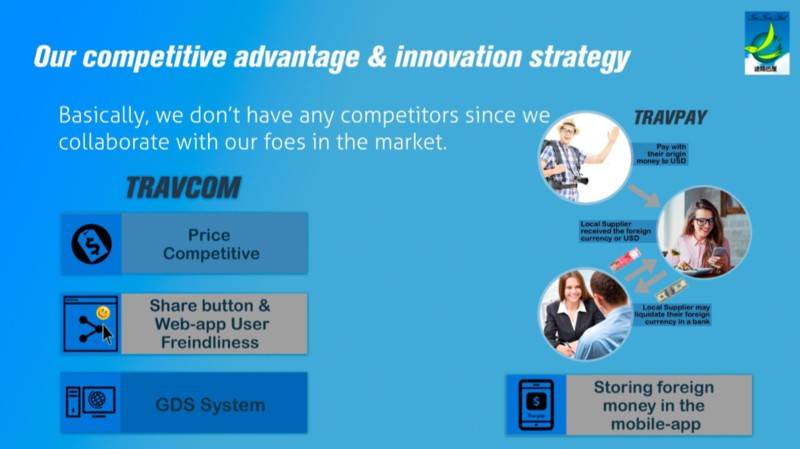 So what is TRAVCOM ? Is it your system already built in place? Is it something you want to build ? TRAVCOM (TRAVEL COMPANION) is a name I made up. 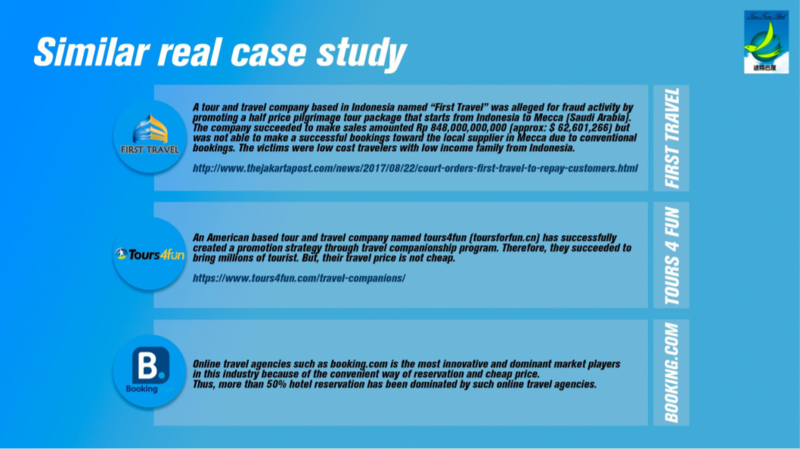 It is a system where Travel agencies are gathering customers from different group into one, so they could get a more bargain power toward the vendors (hotels/tourism spots) in terms of bulk purchasing which mean they will obtain more economies of scale thus cheaper price. The whole industry, including us, already been using this system but they conventionally doing it in excel file while it helps them to gained more customers. Meanwhile, we want to make it into an IT automation system. So we can gained much more exponential revenue if we turn this into an IT platform. Meaning our degree of operating leverage shall elevate. Who’s going to use TRAVCOM ? 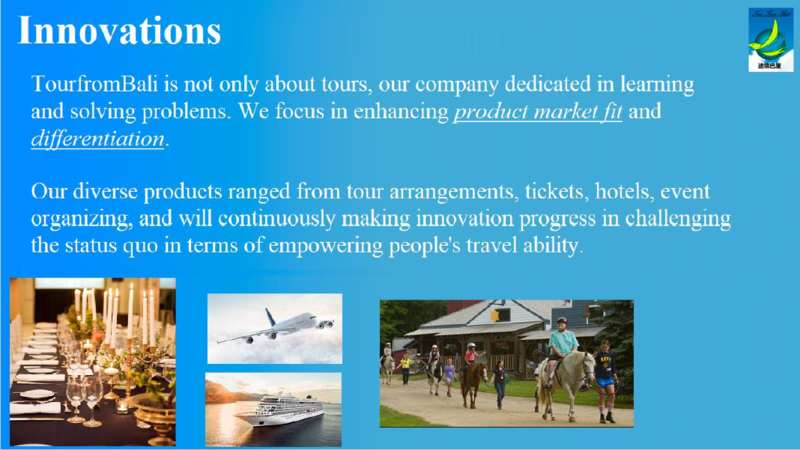 Travel Agencies are the users to post their tour in our platform as they’ve already doing it for us since we started to find more customers for them. 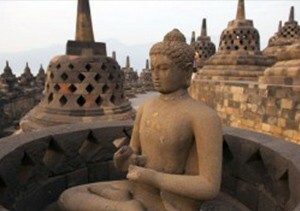 The customers finds the posted travel agency’s offered tours/itinerary/product on our platform. 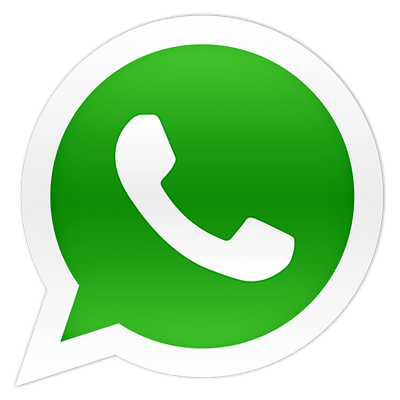 This apps is very useful for guest if we give the right tour and target, as per your supplier of course we will fully support for this program. But, may I know how the guest can access and know the Apps ? How is the planning of distribute this application…? 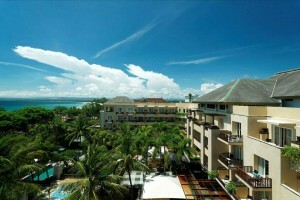 The guest can access the apps through our website or search engine such as google. We will distribute your offering through social media, PPC, etc but with a set very low price target to be very attractive. I still don’t see the value and function of TRAVCOM, Can I see it in something more tangible view ? Do only the additional clients benefit from the lower cost? How does that work in that, if the cost is based on bulk volume, are tickets sold in real-time, and if so, why does the ticket price not go down lower and lower as each ticket is sold? 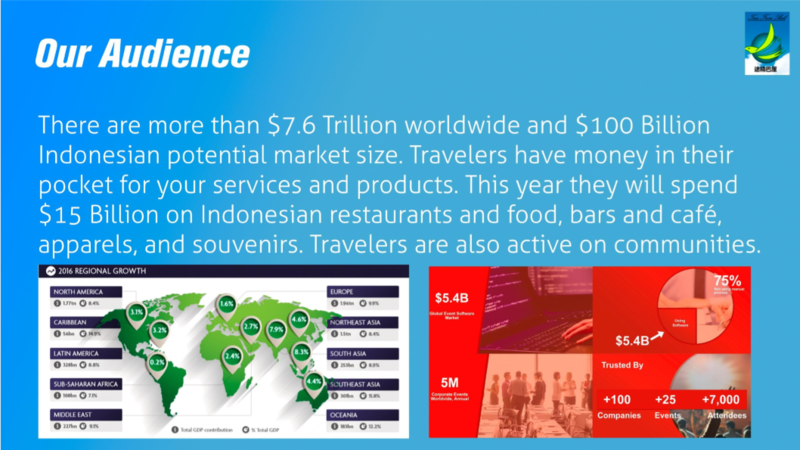 The travel agencies using our service also benefit from this program since they’ll get more brand exposures, especially the small agencies whom are fighting hard against the big ones because the smaller the agency the lesser economies of scale they would able to obtain. Moreover, the bigger the travel agency is, the more cash they have to bulk purchase toward their vendors (especially hotels) thus, they’ll get cheaper rate from the hotels. this is how our business model works. 2. They want to sell for more at a cheaper price, thus they’ll set a set price target. 3. Price will go lower and lower by system as it exceeds it’s sales target. So what happen to the initial group client that have paid more? While there’s another group are getting cheaper. Basically, this system is like a promotional strategy but helping the market segment that can’t afford travelling abroad. 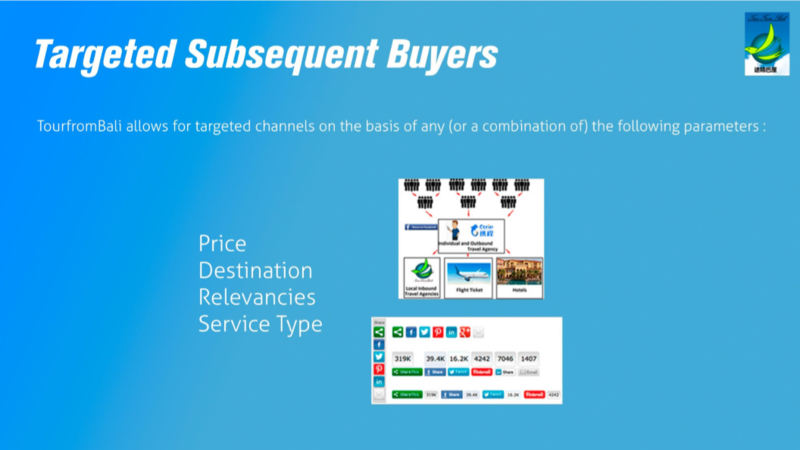 But most travel agency has a coupon promotion scheme, thus they might be able to set a redeem coupon or refund marketing tools for the first number of people whom make a purchase. 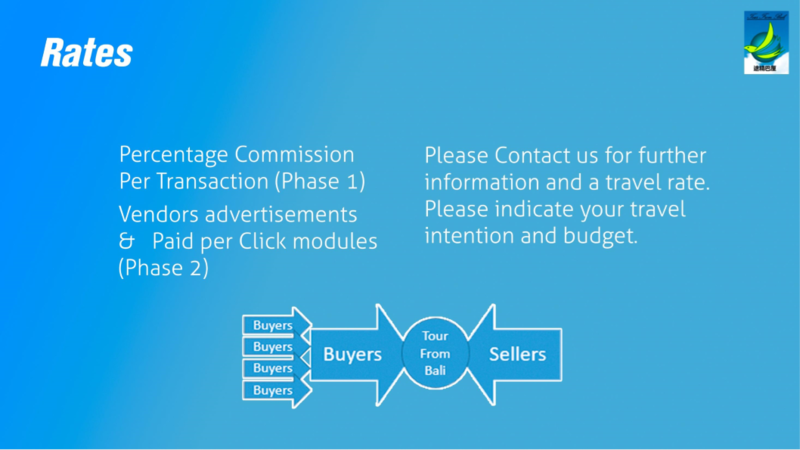 How does the TRAVCOM payment to suppliers schemes works ? It will be a standard payment scheme, we need to receive money from the additional client’s first. Then they will have the authority to press the release button once they’ve arrived or pre-arrival which either way they feels secured. 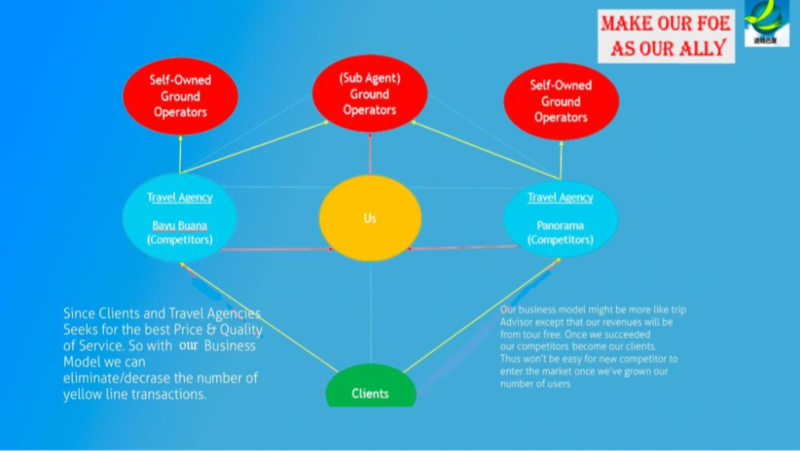 Because if the agency does not served the clients as the clients had expected nor served them at all, then the client can hold and refund the money. 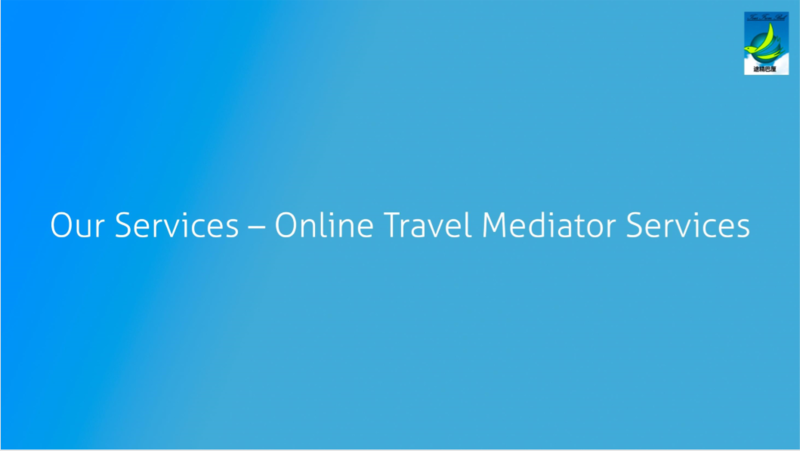 How are you going to control the risk that the additional clients will not make a direct purchase toward the given Travel Agency? 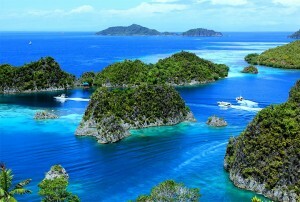 The logo/brand of the travel agency will be appeared only after the client made the released payment on the system. So you are not pitching for TourFromBali rather than for TRAVCOM ? 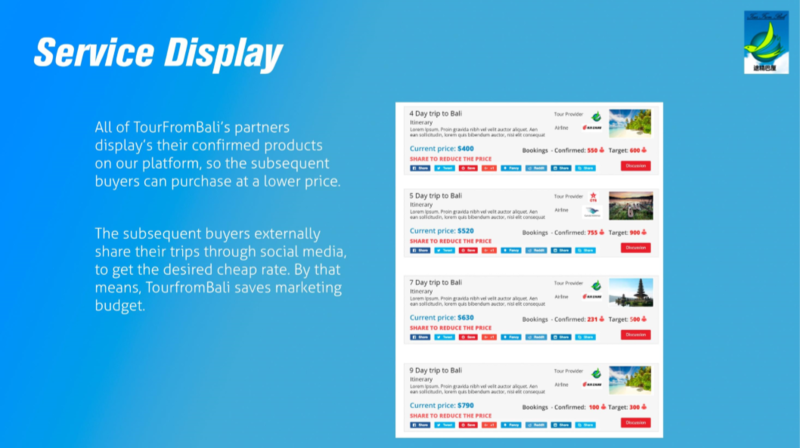 We are pitching for TourFromBali, but some potential investor seems to get disappointed since they think they’ll invest in something in a totally new rather than what’s already gained traction TOURFROMBALI. In fact we’re not pitching to build for TRAVCOM. We want to expand our business by making our IT system stronger. I’ve discussed with a colleague whom had a marketing background, we thinks TOURFROMBALI can be justified as a brand. So it seems to still make sense if we travel to Las Vegas with TOURFROMBALI. 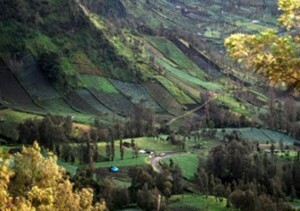 The name TOURFROMBALI was done to aid in initial traction, choose Bali as it is a well-known tourist destination, busy destination, wanted to crack that nut first. 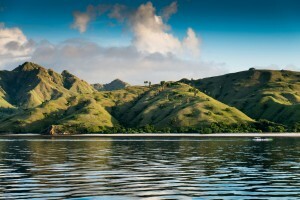 Why are you the first one in an industry as old as the travel industry? No one had yet come out an Idea that TRAVCOM (bulk purchasing) can be systemized into an IT function eventhough TRAVCOM conventional system has been implanted probably for decades. You may check the similar case study below. 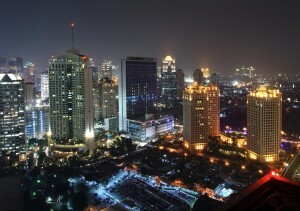 There’s travel startup unicorn such traveloka, how are you different ? how you going to compete with them ? They are more to FIT rather than GIT. Thus, different segment. Why is there no exit strategy in your slide ? We found few potential investors got annoyed with that since if it’s a good investment then there’s always be someone willing to take a share of it.